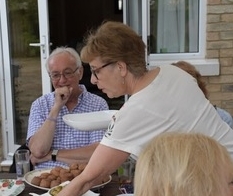 On Monday evening 9 July Dave & Kath Bell hosted a social gathering for members and their partners of all three PCCs in the Benefice together with the ministry team. 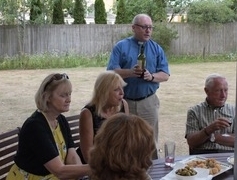 Blessed with a fine evening everyone gathered in the garden to meet up with old friends and make new friends from the other Churches and to meet the “other halves”. Kath had provided a range of savoury nibbles while Dave’s cellar seemed limitless. It proved an excellent opportunity to get to know and understand better other PCC members and discuss ways the different Churches approached issues like attracting new members to the congregation, fund raising, Diocesan initiatives etc. 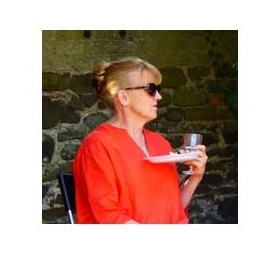 Everyone enjoyed the opportunity for social interaction and Kath & Dave are to be thanked for their hospitality and taking the initiative to hold the event. 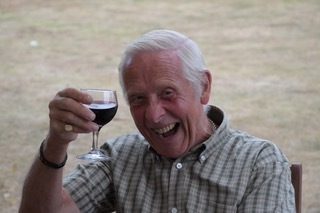 Brian Brown confirming that Ian Smith has ensured that he is not short of wine! 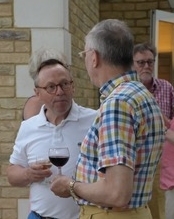 Dave Bell in deep conversation with Michael Liddle; just hope its more cheerful than Michael's day job.